Mixcraft 8 mix down "use selected" option gone? I installed mixcraft 8 and really like it but I can't find the "use selected" option when mixing down. Is it removed or moved somewhere else? I use this option a lot, maybe there are other ways to do it also? Re: Mixcraft 8 mix down "use selected" option gone? 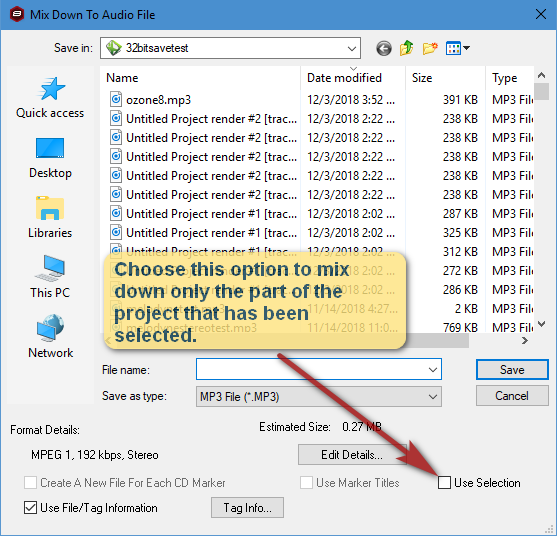 Or are you thinking of the "Mix Each Track To A Separate File" option? That has been expanded into the "Mix Down to Stems" option on the File menu. The option is not available when rendering a project that has a video track in it though...? I think it will only export the whole project when saving as video.